Superb beaches, whitewashed cube houses, sophisticated nightlife, non-stop party can picture Mykonos. Mykonos has something for everyone. Busy beaches as well as quiet beaches, plain local tavernas as well as sophisticated international restaurants. 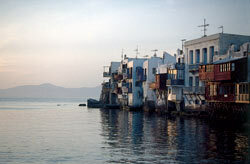 Mykonos town is a picturesque Cycladic town with a maze of tiny streets and whitewashed steps lanes and houses.